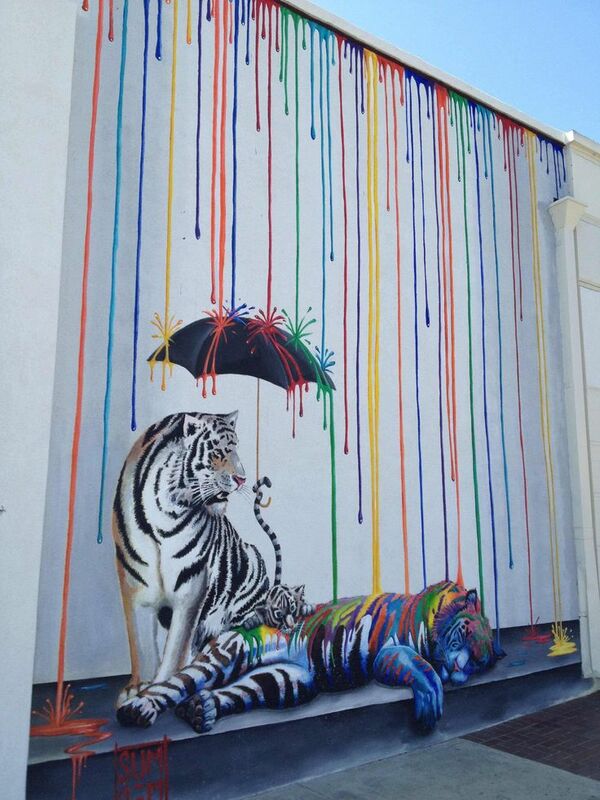 New design standards are tigers. New analysis on historical flooding during Toronto extreme weather, and observed wastewater flows in Ottawa prove it: Design Standard Adaptation is needed for urban flood risk management instead of Climate Change Adaptation - the same can be said for other southern Ontario municipalities. That is, upgrading infrastructure capacity is required to account for significant increases in level of service, as opposed to upgrading for rainfall intensity trends which have been static. But rain causes flooding, right? Wrong. Let's look at the facts. Rain doesn't directly cause flooding. Rain causes runoff, runoff accumulates as flow in drainage systems (or as extraneous flow in wastewater systems). It is ultimately infrastructure flow conveyance capacity, or lack thereof, that causes flooding. Both runoff conveyance capacity and extraneous flow stresses have changed significantly over the decades in Ontario and other jurisdictions, due to new design standards. So why is there a fixation only on rain and climate when discussing adapting for flood risk? Clearly, other processes and factors related to urban hydrology (increased runoff) and infrastructure hydraulic capacity (constrained sewers and blocked overland flow paths) can better explain flooding instead of rain and climate. Yes those are quantifiable factors. Short duration Southern Ontario rainfall intensities trends are mostly insignificant (randomly up and down) and are decreasing for short durations linked to urban flash flooding in overland drainage and sewer systems. More statistically significant DECREASES in rainfall intensity are observed than increases. Annual maximum rain intensities are DECREASING for all durations of 5 minutes to 24 hours at the long term Toronto climate station. 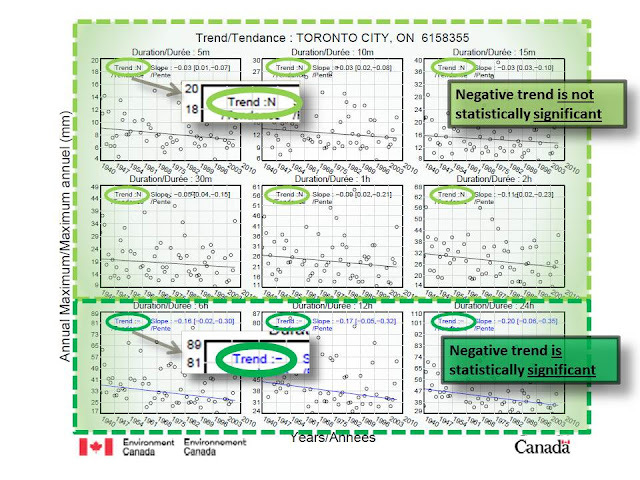 Decreasing trends are statistically significant for the 6, 12 and 24 hour durations. Many municipalities had storm sewer capacities based on 2-year to 5-year return period rainfall intensities. This basic level of service for the 'minor' underground convenience system is characteristic of urban drainage system build before the 1980's, when dual drainage design emerged, adding 'major' overland flow capacity to the level of service to handle extreme rainfall. The earliest a Toronto-area municipality incorporated overland flow capacity into its design standards was 1978. Typically, a 100-year return period level of service is now provided for the major system. This represents about a 250% increase in system capacity as shown below. Design standards increase level of service over time significantly - about 250% for old, pre-1980's 2-year minor-only systems to 1980's dual drainage 100-year systems, including overland flow component. Dual drainage design standard incorporating minor sewer and major overland system capacity to avoid flooding into basements during 'heavy storms'. Other cities have moved to the 100 year capacity standard through the 1980's. Calgary describes the chronology of drainage standard improvements, indicates improved drainage capacity standards in 1988: "The designed capacity for storm drainage systems in new communities is increased to handle one-in-one-hundred-year rainfalls (the former standard was one-in-five-year rainfalls - in some of the older communities, the standard was one-in-two-year rainfalls)." Extraneous flows in wastewater systems (that stress infrastructure capacity, causing back-ups) have decreased dramatically as a result of updated design standards, resulting in a significant increases in level of service during extreme wet weather (i.e., lower flood risk in newer subdivisions). 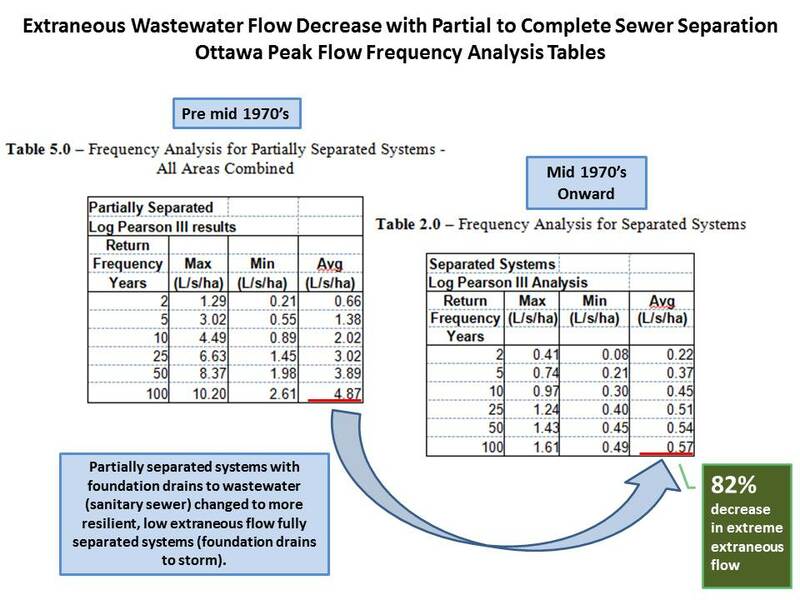 The transition to fully separated sewers from partially separated sewers, i.e., connecting foundation drains to the large storm sewer instead of the smaller wastewater sewer before the mid 1970's, decreases the 100 year extraneous flow in the wastewater system by 82% based on Ottawa's extensive monitoring and analysis. This is a significant reduction in flood stress in newer, post mid-1970's subdivisions. Extraneous inflow and infiltration to wastewater system sanitary sewers decreased dramatically with complete sewer separation (foundation drains connected to large storm instead of smaller sanitary sewers). Fully separated sanitary sewer systems have high level of service. 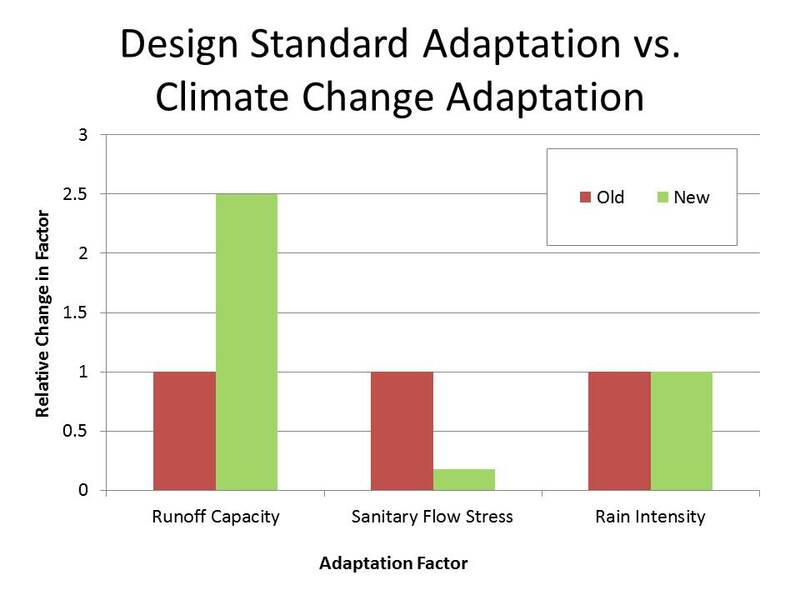 The lower extraneous wet weather flows, result in less sewer surcharge and basement back-up flood potential, as shown in the difference in return period level of service in systems with different design standards. Newer separated sewer systems have a 100 year level of service while older partially separated sewers (with 550% more wet weather flow) have a lower level of service - the capacity varies by system and by catchment size, showing in larger areas where extraneous flow are cumulative, the level of service is less than 50 year in example systems. Results are in the table at right. 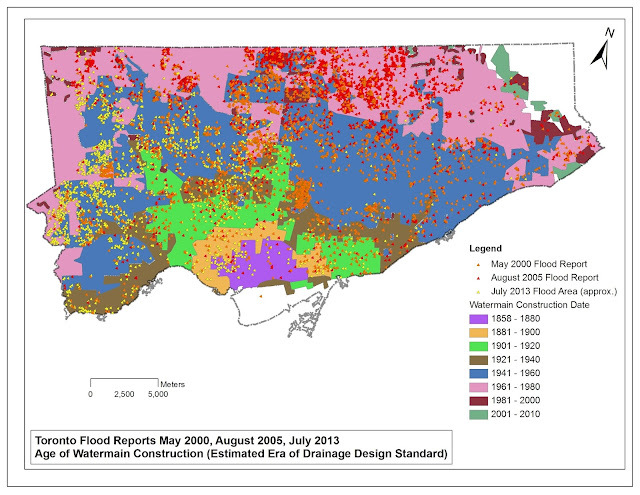 Flood reports across the City of Toronto data for May 2000, August 2005 and July 2013 extreme storms were used to estimate the date of construction and the era of the drainage design practices. The age of watermain installation was used to estimate era, recognizing that in some instances of watermain replacement have occurred since the time of the original drainage design. The following map shows the era of watermain installation and flood sites. This table shows the proportion of addresses reporting flooding in those three events, normalized by the total number of addresses in each era. Post-1980's construction show decreasing relative flood risk. What does it show? Pre 1980 areas (1941 - 1980) have relatively higher flood risks and newer post-1980 areas have lower risks, reflecting better design standards. Why such low flooding in old combined sewer areas? Perhaps CSO relief in those systems, perhaps that August 2005 and July 2013 storms did not hit downtown as hard? Those are some possibilities. Old urban areas built with only 2 year storm sewer capacity may have only 40% of the runoff conveyance capacity of newer, post 1980's areas that have 100-year dual drainage conveyance systems (100 year rain intensities and flow capacity can be 250% above 2 year capacity systems). And old areas built before the mid 1970's, with partially separated sanitary sewers, can have on average over 550% greater extraneous wet weather loads, stressing the wastewater system significantly during 100 year storms. 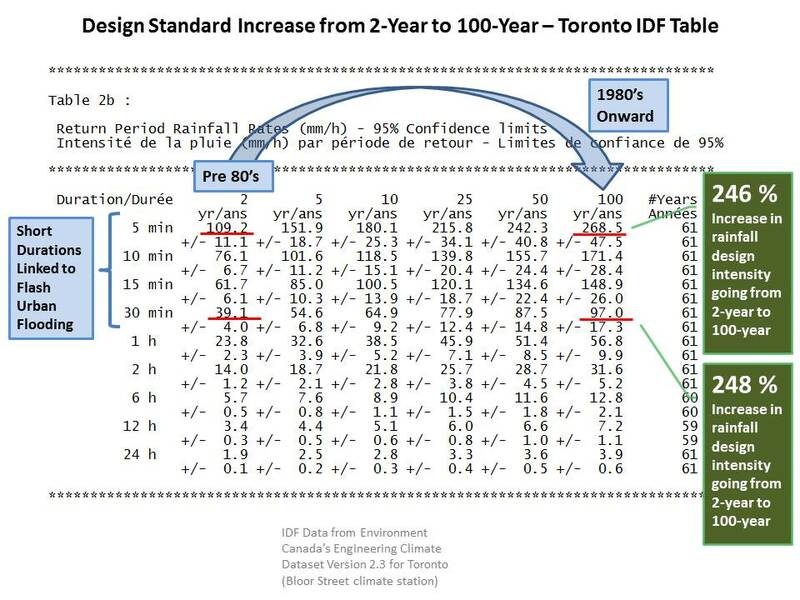 Storm runoff conveyance capacity has increased with new standards, and sanitary extraneous wet weather flow stresses (inflow and infiltration) have decreased with new standards, while rainfall intensity conditions have remained static in Southern Ontario - obviously design standard adaptation is needed in older urban areas to mitigate urban flood risks including sewer back-up and overland flood perils. Runoff capacity has increased 250%, and 82% of sanitary flow stresses have been eliminated, due to current design standards.